Online food ordering website & app, offering the best features of selecting delicious foods and top-rated restaurants located across India. Nowadays, Foodpanda is one of the fastest growing websites that provides you the online access to the best restaurant which can deliver delicious food at your doorstep. Started in 2013, Foodpanda continues to grow with millions of users having ordered food online till date. Freedom of selecting tasty foods with a wide range of best restaurant is what Foodpanda stands for. Foodpanda came up with the motto of making online food ordering fast and easy for everyone. What more could one wish for than getting to order food online at literally any moment of the day. Foodpanda fulfills your every demand serving you 24x7 and it never shackles you in time limits. Be it breakfast, lunch, dinner or that late night dinner, Foodpanda offers you the best a lip-smacking meal any time of the day. In addition, Foodpanda always has on its menu with a variety of cuisines and dishes, ranging from traditional local foods to mouth-watering fast foods. It also serves the delicious cuisines of the likes of Japanese, Continental and Punjabi and many more. You name the meal and Foodpanda has it. And it is not at all that you can order food only from local restaurants nearby you on Foodpanda. It also enables you to order food and meals from fast food chains like Dominos, Pizza Hut and Box8. Foodpanda also has its app and with that, you just need your smartphone to order delicious food any time. Available for both Android as well as iOS platforms, the Foodpanda app is designed so as a customer can easily navigate and find the foods while ordering from a smartphone. With its simple and attractive UI, it lets you seamlessly order food on the go. Besides the app, Foodpanda’s responsive website is always there to grant you the option of ordering food by visiting the lite version of the website from your mobile. If a restaurant happens to be just near the street where your home is located and you do not mind taking a walk up to the restaurant, you can always place your order at Foodpanda, choose the Takeaway option and pick up your order as per your own convenience. Foodpanda believes that food delivery need not be overpriced. Foodpanda’s philosophy is that you can always have great meals delivered right at your doorstep and that need not burn a hole in your pocket. Working towards making this philosophy a reality, Checkout for Foodpanda offers today to get daily deals that might help you get free delivery, or you may get an attractive discount from your favorite restaurant. TalkCharge knows that you are as hungry for Foodpanda promo codes and deals as you are for tasty and delicious food. 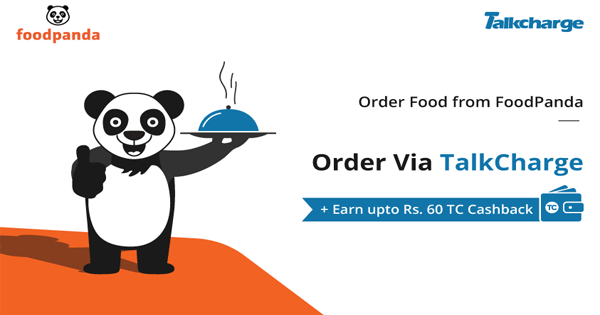 TalkCharge provides you the unique opportunity to order food at Foodpanda with offering some verified Foodpanda coupons and discount codes that can be redeemed to avail Food panda offers. With TalkCharge, also provides foodpanda firstime user coupons and foodpanda new user offers to enjoy delicious foods and discounts to all new users. At TalkCharge there are many offers and coupons available for existing users. An existing user can make the use of foodpanda coupon for an old user, or they can look out of foodpanda coupon for existing user to get heavy discount on their orders. TalkCharge website or app lists for latest Foodpanda offers with verified Foodpanda coupon code, promo code and discount coupons to its valuable customers. Whenever you plan to take your friends out, it can get a bit heavy on your pocket. For exactly such times, TalkCharge offers you a discount of a whopping 30 percent across all major restaurants. This limited period discount is valid on Chinese, Continental, North Indian, Thai, Pizza, Biryani and Mughlai. For all our users from Gurgaon, TalkCharge offers flat 20 percent off on all food items from Leaping Caravan. We at TalkCharge know how much people crave for Japanese delicacies. That’s why TalkCharge is offering flat 25 percent off on Japanese cuisines to all its users from Delhi. Each time a user chooses to pay through MobiKwik wallet, TalkCharge offers Mobikwik super cash which will be directly credited into the user's MobiKwik wallet within 24 hours. To avail, Foodpanda Paytm offers you can use Paytm wallet to pay for your order at Foodpanda and apply the mentioned Foodpanda promo code during checkout and enjoy free delivery. That’s great, isn’t it? What’s more, this amazing offer can be availed any number of times by a user up till 30th of September 2018. The obsession of the people of Gurgaon with Pind Balluchi is known to all. With that in mind, TalkCharge is offering flat 10 percent off on Pind Balluchi food to all its users from Gurgaon. The Abhiruchi Hotel of Bangalore is liked by many for its Andhra, Chinese, North Indian & South Indian dishes. In addition, their special boneless biryani, prawns biryani, egg biryani, veg biryani, lollipop biryani and fish biryani are very popular among the people of Bangalore. Therefore, to all its users from Bangalore, TalkCharge is offering flat 35 percent off on Abhiruchi Hotel food. How can Mumbai be left behind when the users from so many cities have been offered great deals by TalkCharge? Well, for its users from Navi Mumbai, TalkCharge is offering a flat 20 percent off on mouth-watering Mexican cuisines such as fires, wedges, nachos, Maggie, pasta, sandwiches, rice varieties and dessert fries. Another attractive deal for TalkCharge users from Bangalore! The Biryani Pot, which specializes in wraps, biryani, Chinese and North Indian dishes, has got over 160 delicious cuisines listed on its menu. TalkCharge is offering users from Bangalore a flat 20 percent off on food orders from The Biryani Pot. If you would want any assistance from Foodpanda or have any concerns or if you would like to share your valuable feedback with the Foodpanda team, you can always contact the Customer Service Team without any hesitation. You may use the Live Chat feature on the Foodpanda app or website. Alternatively, you could send an email to the team at customercare@foodpanda.in. The Foodpanda India Corporate Office is located at Plot no. 82 A, Sector 18, Gurgaon, Haryana-122015.